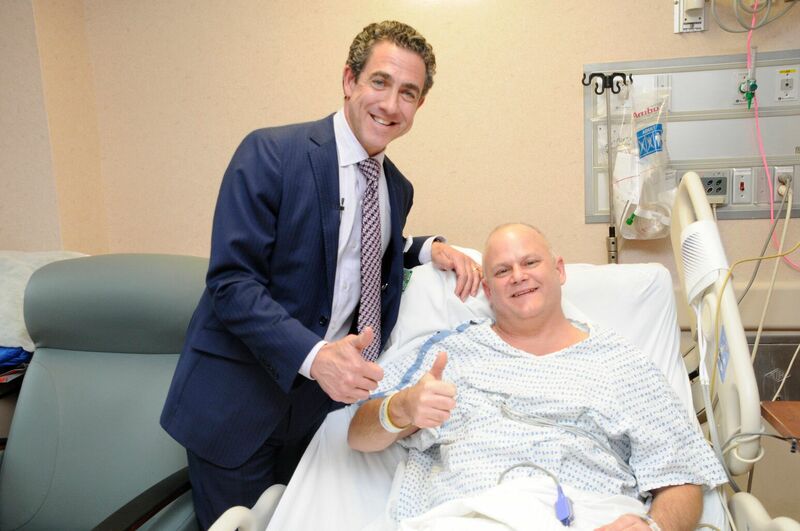 Patient Tim Hartig and John Boockvar, MD, give "thumbs up" after awake brain surgery. Michigan resident Tim Hartig listened to “I Won’t Back Down” while surgeons removed a glioma brain tumor. Tim Hartig, 54, an automotive tool engineer from Detroit, MI, has been a Tom Petty fan for years. He didn’t realize what a role Petty’s music would play when Mr. Hartig recently had to undergo an awake surgery to remove a glioma brain tumor. When the operating room staff at Lenox Hill Hospital asked him what kind of music he would like to hear during his brain surgery, Mr. Hartig requested Petty’s “I Won’t Back Down.” The music, which played softly in the background, helped soothe Mr. Hartig at a time when he needed it most. The procedure which took place January 3, was performed by Lenox Hill’s multidisciplinary team including John Boockvar, MD, neurosurgeon and the hospital’s director, Brain Tumor Center; Peter Costantino, MD, executive director and senior vice president of Northwell Health’s New York Head and Neck Institute; Derek Chong, MD, vice chair, neurology; and, Virginia Ann DeSanctis, PhD, chief, neuropsychology. Prior to January’s surgery, Mr. Hartig underwent an attempt to remove the brain tumor at a hospital in Detroit, but surgeons were only able to remove 10-20%. Mr. Hartig wondered if more could be done to remove the remainder. His daughter researched online and found Dr. Boockvar. Upon reviewing the magnetic resonance imaging (MRI) scans, Dr. Boockvar advised that he would be able to remove most of the remainder of the tumor with a safe surgical approach, but Mr. Hartig would need to be awake for the surgery. The world-renowned surgeons in Lenox Hill's Brain Tumor Center offer comprehensive care for brain and spinal cord tumors in adults and children. With the help of Drs. Chong and DeSanctis, brain mapping was done as well, which involves using a small electrical stimulation device to observe any changes in the patient when an area of the brain is stimulated. If an area of the brain is stimulated and the patient stops moving or loses the ability to speak, then the surgeon knows that the area is vital and cannot be removed or cut to access the tumor. Mr. Hartig recently completed physical rehabilitation in New York City and is happily back home. He is walking with minimal assistance and has full functioning of his arms and hands.